I shall send my creatures after you. If they catch you, they will tear you to pieces. 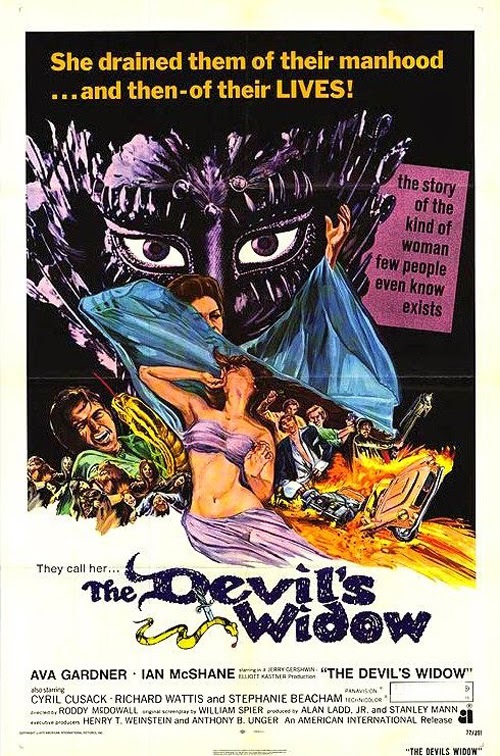 (SPOILERS) Also known as Tam Lin, The Devil’s Widow and Games and Toys, Roddy McDowall’s, the great Roddy McDowall’s, sole outing as a director has a bumpy history, Its rocky road reaching cinema screens (as the various titles suggest) saw Roger Corman’s AIP cut it in the US against the director’s wishes, and it was consigned to an indifferent-at-best reception everywhere. It’s undoubtedly true that this is not an urgent affair, and those seeking to divine specific connections between the dregs-of-counterculture plot and the Scottish folktale that inspired it may find themselves wanting. And yet it’s a richly textured affair, one that juxtaposes classical Hollywood filmmaking flair (McDowall was a natural on this evidence) with a seductive ambiguity that flirts with contemporary temperaments and occult inclinations. It can be read literally as a piece shorn of the fantastic, no doubt, but McDowall’s visual subtext tells a different story. TV veteran William Spier twisted the Scottish ballad (perhaps the best known form comes from Robert Burns) into a modern state, but one much murkier and less tangible than its source material. As originally set out, Tam is a formerly mortal man who was rescued or ensnared by the Queen of the Faeries. He seduces young mortal maiden Janet. On discovering her pregnancy she seeks an abortion, but Tam’s opportune reappearance in her life brings about a change of mind. Tam fears he is to be given to Hell as a tithe by the faeries, such is their custom. Only Janet can prevent this by abiding with him through his physical transformations, caused as part of the offering; by so doing, the Faerie Queen is thus defeated. In his adaptation, Spier retains the basic relationship between Tom/Tam (Ian McShane, whom I continue to be surprised by in earlier work despite knowing logically that his career didn’t suddenly spring forth with Lovejoy) and Janet (Stephanie Beacham). The significant embellishment comes with the Queen of the Faeries, now incarnated mortally as Michaela Cazaret (Ava Gardner). Instead of a faerie realm she presides over a coterie of cool young things, who must be regularly replenished with psychedelics if they are settling for the idyllic Highlands rather than hip and happening Carnaby Street. I say coterie, although coven might be a better term, as unsuspecting as most of them seem (the picture’s decidedly darker second entourage is identified in the credits as “Second Coven”). Michaela may be ephemeral, but what, if any, special powers she has over her flock remain tantalisingly elusive. All may be literally explained (psychedelics, murder, impressionable personalities and deference to vague forms of divination) but there’s an air of Countess Bathroy about a woman who replenishes herself through the essences of young. The casting of (hardly old at 48, but nevertheless considered so in Hollywood terms) Ava Gardner invokes the likes of Whatever Happened to Baby Jane? and other recent screen appearances by former starlets “past their prime”. McDowall apparently opined that Gardner wasn’t all that his first choice Elizabeth Taylor would have been, but I have difficulty finding fault with her performance; Gardner is all silky serenity until she turns on a knife edge and reveals her fangs. While the picture bears a rich, elegant look courtesy of cinematographer Billy Williams (he lensed Billion Dollar Brain for Ken Russell and went on to win an Oscar for worthy snorefest Ghandi), its themes, resting beneath the genteel adornments, stretch out like tendrils towards less reassuring fare; in particular the untidy brilliance of The Wicker Man, only two years later, another film that demands its sacrifices while none besides the intended victim bat an eyelid. Like that film, unsettling folk songs complement the proceedings (Paul Giovanni in The Wicker Man, Pentangle here - Stanley Myers furnishes the score-proper). They are portents of the unwholesome truths lurking out of sight (Pentangle were at their peak at the time, suggesting that McDowell, if not quite an aging hipster, was more than able to distil the zeitgeist). Tom: She can afford to live in her dreams. And she, she takes us into them for company. You learn not to care. There’s also an undercurrent of obeisance to a charismatic leader that brings to mind a less dissolute Charles Manson and his sway. Since McDowall would have been in production in 1969 it would be unlikely there was any direct correlation, except in so much as he clearly perceived that the decadence of the period was a side effect of its social and political progress. Another consequece of such savvy is missing the boat; the cultivated fashionability of his bright young things really belongs in a picture made several years earlier. Michaela: You grow older every day. I grow older every sodding second. The whys and wherefores of Michaela are left undisclosed. One of the best scenes finds Tom, determined to leave, warned off indirectly (if pointedly) by her major-domo Elroy (Richard Wattis, playing a “rancid old queen” as Tom puts it, weevils away in a wonderfully insidious manner at the edges of the picture). He recounts how two previous lovers, “two little stories about dead children long ago” – who presumably sought to leave her – found themselves in car wrecks (“You wouldn’t believe would you, that a face could spread so wide”). Elroy has been in Michaela’s service for 16 years and one of these took place 15 years ago. Was she also dispatching men who scorned her during her 30s, or does she have an aging picture in the attic (Tom has a terrible hangover the morning after, she is fresh as a daisy)? And, even if she means it metaphorically, just before sending her wolves after Tom she informs him that she never resigns herself, never gives in, and never lets go; “That, my lamb, is the elixir of life”. When Vanna (Victoria Fairbrother) is asked to tell the future through touching objects (blindfolded), there’s a wonderfully creepy moment when Tom’s yellow-tinted sunglasses are handed to her (the same yellow-tinted sunglasses Oliver is later seen sporting, clearly a signifier of Michaela’s possession) and she becomes terrified. Earlier, a tarot reading (“And all that gypsy trash”) reveals The Lovers, “an ordeal overcome” (for Janet – and Tom). The white witch-come-counsellor Miss Gibson, who Janet visits, used to cast her mother’s horoscope. The mystical suffuses the picture but never comes into sharp focus. Michaela’s turning point is venomous and startling. Even though we have seen her reaction to future Withnail & I director Bruce Robinson as the wettest of possessive wet blankets (“You can live, you can live, and if you’re too wet to live you can die”), nothing has approached this sudden fiery malignancy (Michaela dismisses Alan’s hopeless dependency, but it’s a different story when Tom rejects hers). She’s particularly cold when poor pregnant Janet strays across her door with a sob story (“I’ve seen a lot of girls go through that little crisis”) but shows no more feeling towards her groupies, whom she dismisses as “Breastfed teenagers! Get out, all of you!” It’s certainly curious that the new bunch, a surly assortment of black-clad bullies and dim-watts, are all Elroy’s “special friends”. Quite where does he find them, and what does he get up to when he isn’t being personal secretary? Tom: You probably can arrange my death, but you can’t arrange how I feel about it. Tam Lin becomes a much less interesting picture if we simply break it down as a tale of a woman scorned (“Where will you be when I’m older?”), although that is essentially what it is. Michaela’s reasons for providing Tom with Janet’s whereabouts (albeit indirectly) were most likely just to make the eventual loss all the more painful (their reunited joy snatched cruelly away). When he is bundled back to her mansion Michaela is all suppressed menace (“Was it a strain playing house with Miss Muffet?”) as she impels him to engage in a process he cannot escape. As with her previous victims, “You, in fact, will kill yourself”. Whether or not she had a coven for back-up then too, well quite possibly. The black mass of parlour games-turned-sinister (“You may prevent him from leaving the house. Otherwise he’s not to be touched”), in which Oliver plays murderer and Tom victim, recalls the baying mob of The Prisoner’s Dance of the Dead episode (also featuring a malign matriarch) while Michaela’s language brings to mind the fury of the Maenads, with her as a female Dionysus; “I shall send my creatures after you. If they catch you, they will tear you to pieces”. Tom’s psychedelic trip, and pursuit, is, mostly, a bravura sequence, combining point-of-view, slow motion and handheld camera with subjective sound to arresting effect. It’s perhaps best to forget the bear and the snake (the transformations of the folktale played through Tom’s altered state), although the flambé sequence is better executed. As with so much here, it’s unsaid why the minions are not allowed to go ahead and finish Tom off, but Oliver seems certain that this isn’t on (“It’s over. It’s finished. It hasn’t happened”). There are the rules of the folktale, but as for the ones that Michaela abides by? It seems Janet has won him fair-and-square, and no further vengeance is permitted. It’s appropriate though, that Michaela should continue to weave her spell and not be brought to book, as a force of uncertain power and continuance. David now sits at her side, clad in her special yellow specs (“You mustn’t forget these”), presumably for as long as he still takes her fancy (“I have money everywhere”). Spiers dialogue in general is heightened and memorable, delivered with suitable reverence by a cast who know they have choice words to savour. Even the faux-hippy speak has a cryptic bravado (when Janet arrives with a puppy to sell, she is told, “Everything is possible. Try up there”). David Whitman, as would-be-Tom Oliver, gets many of the best lines; he’s offhand, louche and callous. On hearing Tom’s yell of pain he is asked what it is; “Without a doubt it was the cry of a human voice”. His is the role of provocateur, biding his time until he’s first in the totem; he comes across as a Gareth Hunt with charisma (I initially mistook him for Hunt, although that might be partly down to Joanna Lumley’s presence). There’s a poetic cadence to much of the dialogue too. It’s unnaturalistic, but works in context; “Now tell me, does this not fill you with remorse and chagrin?”; “Little lies scuttling inside you like beetles”. The collection of degenerate fellows and flimsy flakes that hang out with Michaela include several readily recognisable faces, from the aforementioned Robinson and Lumley, to Sinead Cusack (her father Cyril plays Janet’s vicar father) and Madeline Smith (The Vampire Lovers, Live and Let Die, Erotica and in the film version of Up Pompeii and many other breast-centric roles; here she’s a girl with a tiny mind and a tiny dog). While they aren’t overtly consuming substances (aside from the line “I’ll swallow anything as long as it’s illegal”), or flagrantly debauched, they come up out with suitably space-wise aphorisms (“Life is an illusion. Therefore nothing is permanent”) and exist in a particularly affected and preserved space somewhere between stoner heaven and a Victorian garden party. It isn’t ever quite clear how the more vital Tom fitted in with the group, except that he’s accepted as the current favourite. McShane is better as the puckish figure we see casting his drunken eyes lustily over Janet (the only time we really get a hint of the non-human folktale version of his character) than the victim of Michaela, but the theme of love saving him from the clutches of the Queen of the Faeries is effectively transposed to his comedown from her lifestyle trip (both represent a rarefied realm). Tom’s actual trip is a decidedly bad one, while the cold meat hook reality of his severance from Michaela is a grubby (“morbid little”) caravan. On entering the trailer park, Janet’s less-than-illustrious life ahead can be seen flashing before her eyes but she doesn’t falter. Janet from the vicarage is a bit on-the-nose as an unsullied maiden, but it serves to point out that McDowell has in mind worlds of purity contrasting with those of dis-ease; this is not a picture for advocates of heavy realism. I’m not sure I fully buy into Beacham in the part; perhaps it’s the knowledge of what was to come with Dynasty and The Colbys but she has the air of one a little too worldy-wise. I could see the argument that Janet’s story lacks the vibrancy of the world of Michaela, but I found the contrast effective. There’s also the scene in which Tom goes to church, his curiosity piqued by her world. If the relationship between Tom and Janet never really sparks, well good is never really as interesting to watch as bad is it? In terms of technique, McDowall chooses some interesting ways of getting his story across. Still frames dictate the first encounter between Tom and Janet by a babbling river (perhaps McDowall had been watching Butch Cassidy and the Sundance Kid’s interlude? ), as she is initially put off by his satanic charms and then lured back. Its an interesting device, probably much too self-conscious to be accepted by audiences now, but that’s one of the reasons films of this period are often much more interesting visually than they are today. Miss Gibson: She used to talk to me sometimes. I cast her horoscope. It would be tempting to see hedonism versus righteousness as a thematic lesson, but McDowell doesn’t seem terribly interested in marking this out as a morality play; at least, not along those lines. The white witch is crucial in this regard (so too is Rose, who gets to glimpse behind the veil), pointing to greater truths than the well meaning but out-of-touch Vicar whose words sound all very well but lack resonance (“Did my father realise she came?” asks Janet of her mother “Does your father realise you’ve come?” replies Miss Gibson). She makes it her point to allow others to be free (“I don’t tell people what they ought to do”) although she is willing to offer advice (“If you get rid of the child, you’ll be sorry”). Janet doesn’t have quite such a laissez-faire approach (“You can’t stay a boy all your life”), but hers is a markedly different hold on Tom from Michaela’s (“You belong to me now”). Michaela: I’ll give you one week’s truce. Then I’ll hunt you down and I’ll kill you! It’s probably appropriate that Roddy McDowell made a very British film; he always seemed like the most mannered and somehow English of Hollywood actors. It may be that The Ballad of Tam Lin is neither sufficiently fish nor fowl to satisfy a particular audience, but I found that part of its unique appeal. Much more of a melodrama than it is a horror, too non-committal to be labelled a tale of the supernatural, and much too reserved to characterise the era of free love that was now on its last wheezing legs, it doesn’t get under the skin or resonate with its skewed take on pagan Britain the way that The Wicker Man would. But the picture has many charms and delights if one perseveres, including a fine role for Gardner that sees her villainess live to fight another day, a tremendous supporting cast equipped with some choice dialogue, a memorable score and thoughtful compositions from its debut director. If you like the enigmatic and arcane, The Ballad of Tam Lin could prove an unexpected treat.